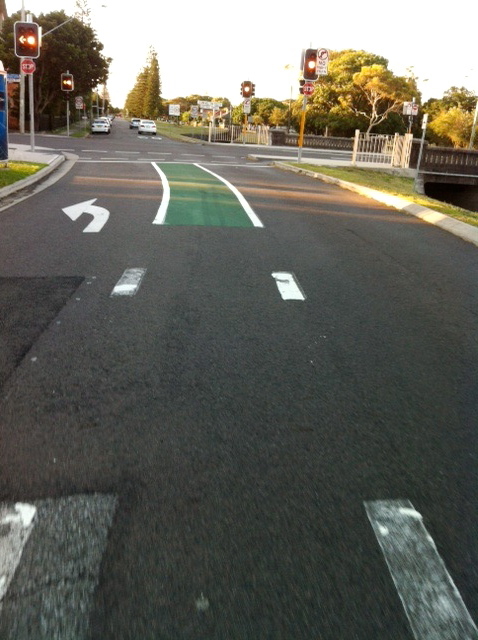 We have a number of these green painted bike lanes in Newcastle, and I like riding on them, they provide a sense of safety in the traffic and at lights as in the picture above. I feel as if I have a designated place on the road and can ride/wait there with impunity. But how much safety do these lanes acually confer to cyclists? Maybe the only real benefit of them is that they tell car drivers that there may be bikes in them, or increase the penalty if they actually hit a cyclist who is riding in a green lane (which, of course, is cold comfort to the hit cyclist). With infrastructure dollars needing to be utilised as effectively as possible, the green lanes may prove to be of little value to cyclists. I have written about such lanes before here and here and there is a discussion going on about them at the Newcastle Cycleways Movement site here as well. It would be good to hear others’ views on them. 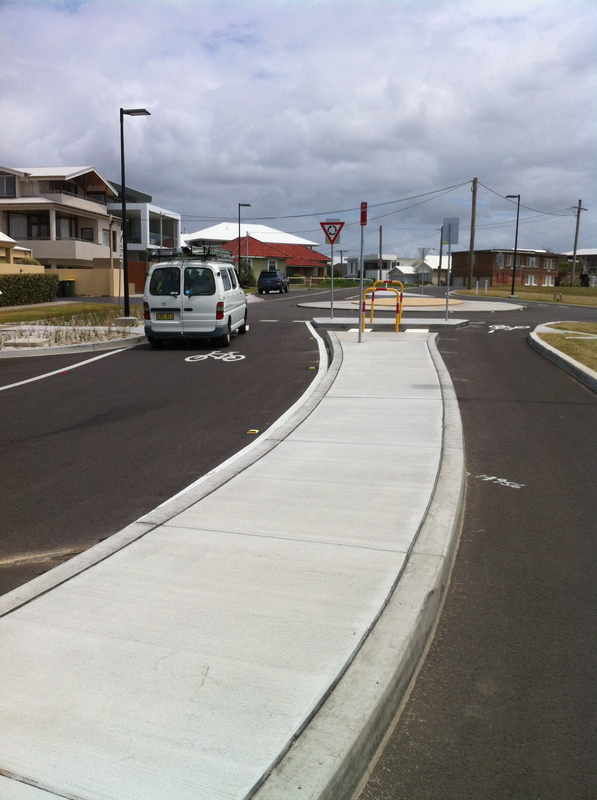 This entry was posted in Uncategorized and tagged cycleways, infrastructure, newcastle, Roundabout. Bookmark the permalink. I think your point about safety in the short-time could be very spot on. I don’t have personal experience so I can’t relate in that way. I think the value, which shouldn’t be underestimated, could be very real in the long-term. The more steps taken for bicycle infrastructure and the more visible bike commuting is, that will have a positive impact (one would hope) on people’s attitudes towards cycling. The first attitude that will change is that there ARE people who are actually cycling. Too many times, people are in denial about how many people bike commute, or WANT to bike commute. It might also help more cyclists FEEL safer, which may cause more cyclists to ride. Thus, increasing the number of cyclists. Which, in turn, also reinforces this new attitude change among drivers. That could be very powerful and contribute to more significant change in the future. I hadn’t thought that these lanes would appeal to non cyclists but that does make sense and the consequent increase in cyclists would make them well worth the investment! Thanks for the comment! I’m ambivalent about the whole green lane thing. On the plus side they serve to remind motorists that there are cyclists using the road. On the minus side, they create a false sense of security for cyclists (especially when the green lane has cross-hatching, such as the Wickham example on the NCM site: how many people actually understand what this means?). I also think that the green lanes tend to be used in places where competing road use isn’t an issue. By this I mean that green lanes generally appear on wider stretches of road (the MarketTown example is an exception) where there is likely to be less dispute about sharing the road. But where there are real space issues, there are no green lanes, at least none that I’m aware of. I hate that section next to Aldi too Mark, I often use the footpath in that section for that reason. It’s always interesting when the green lane is extended across the front of the traffic at the lights so that you can legally filter through and pull up in front of the stopped cars. The looks of confusion (and sometimes frustration) on the motorist faces as you come through and pull up in front of them is priceless. The other issue is motorist’s understanding of when a bicycle lane is active or not. We don’t have any of those bike boxes you refer to here, Ian. Not yet anyway. I am not sure what you mean about the bike lanes being active. Are there times when they cannot be parked in?